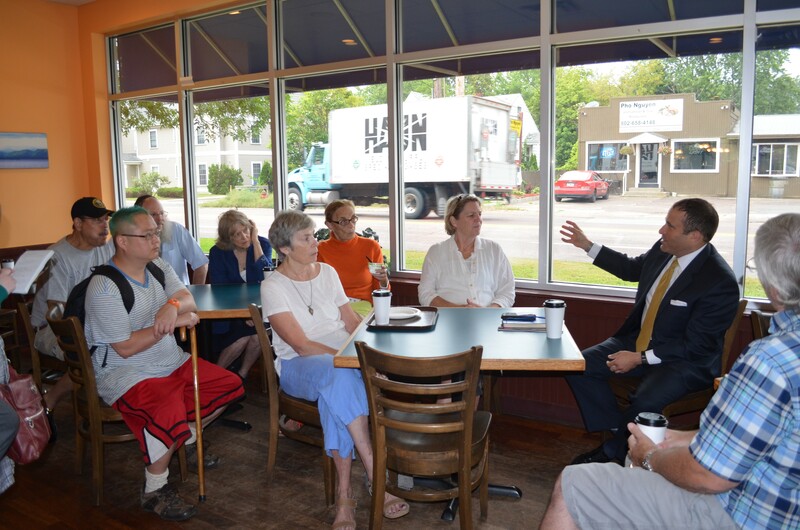 Burlington’s new police chief, Brandon del Pozo, showed up at the Bagel Cafe & Deli in the New North End for what was supposed to be a low-key coffee date with local residents. Instead, a media scrum met him outside, with questions about an arrest made the night before of a Burlington police officer, Ethan Thibault, who was charged with domestic assault. Del Pozo faced the TV cameras calmly. It’s not the first time he’s publicly faced uncomfortable subject matter since coming to Burlington: His confirmation hearing overflowed with people concerned about his background as a member of the New York City Police Department. Del Pozo, who met with many of his critics and gave interviews about his history, mentioned several times Wednesday that he was eager to talk with residents. “I apologize for the press,” del Pozo told the gathering of roughly 30 people, who found themselves on camera as they sipped coffee and ate bagels. The new chief, who's continuing former chief Mike Schirling's tradition of scheduling regular coffee get-togethers with citizens, explained the charge that's been made against Thibault. The officer's name is familiar to many New North End residents. Two years ago, Thibault fatally shot a mentally ill man in the neighborhood. Residents didn't press him on the news. When del Pozo asked if people had questions, a woman eating Chobani yogurt observed, "Seems like you're overqualified." Del Pozo, who has three master's degrees and is working on a doctorate, stumbled through an answer until she told him, "I'm teasing you." Clean-shaven and wearing a suit and tie and well-shined shoes, del Pozo didn't take his first sip of coffee until nearly an hour into the meet-and-greet. In contrast to del Pozo's confirmation, the audience was friendly and full of praise for its new chief. But people still had plenty of questions. Is he interested in receiving hand-me-down military equipment from the U.S. Department of Defense? No. In fact, del Pozo said that the department has returned the only equipment it received through the program — two pairs of night-vision goggles — and allowed its memorandum of understanding with the defense department to expire. How does he feel about arming officers with Tasers? They're necessary and often an alternative to firearms, del Pozo said. He also noted that the department will likely replace its aging devices soon. "The only thing worse than a Taser is a Taser that doesn't work," he said. Will he crack down on cars that speed down North Avenue? Del Pozo responded that officers have to target areas where accidents are high. Alluding to the shooting Thibault was involved in, Tom Ayres, a Democratic city councilor from the New North End, asked del Pozo how he'll address mental health emergency calls. Del Pozo pledged to work social service providers, recruit officers with mental health expertise and make sure that training for current officers is sufficient.